Remember to measure your pet for the paw-fect fit. Touchdog Quantym-Ice Full-Bodied Reflective Dog Jacket with Blackshark Technology is a breathable, cold-repellent, impermeable and tear resistant jacket made with an innovative, lightweight, water, wind and snow proof material. Perfect for the outdoor dog, this durable jacket will keep him warm in blizzard, typhoon, hurricane and even rainstorm weather. The outer shell lined with 3M reflection for emergency visibility and is double waterproofed, windproof and tear-proof to stand up to Mother Nature’s largest challenges. The thick layer of anti-static polar fleece is breathable and offers ventilation while providing added warmth and comfort for your dog. Full-body, reflective coat is engineered and tested to withstand the harshest weather conditions possible, including blizzards and hurricanes. Inner lining is lightweight, waterproof, windproof, snow-proof, breathable, cold-repellant, impermeable and tear-resistant. Outer shell is double-waterproofed, windproof, breathable, tear-proof with 3M reflective lining for emergency visibility. Interior features a thick layer of anti-static polar fleece that offers ventilation, warmth, and comfort. Adjustable leg straps and auto-adjustable inner tubed lining provide a great fit. Features a leash slit. Length: Measure the base of the neck to the base of the tail. Add 2 inches for comfort. 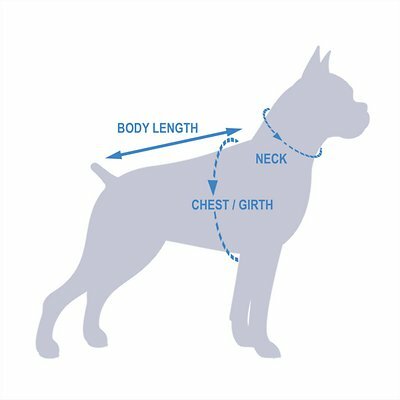 Neck: Measure around your dog's neck leaving room for two fingers. Chest: Most important measurement; measure your dog's chest around the widest part. Add 2 inches for comfort. Keeps dog warm and dry! I really wanted to give it 5 stars but I have Chiweenies and they are hard to fit. They have long bodies and short legs. So the length of the jacket fit but the length of the legs were too long. I pulled the pull ties on the legs but my puppies little legs either got pulled up inside the jackets or they would walk out of it. Other than that issue it’s a fantastic design for the price. It keeps them warm and dry! They wear their boots with it and they’re ready for old man winter! I'm fairly pleased with this snowsuit. I have a 65lb pit bull who measured out to the very max of the XL size. It fits her nearly perfectly, with the chest/neck area being a tiny bit too snug. I am extremely pleased with how warm it seems, and she finds it very comfortable. I had previously purchased another Touchdog coat that fastened with snaps and velcro, and while the material was nice and the fit was good, my active dogs would pull the fastenings open with ease. Definitely would (and have!) recommend to others. Will probably purchase another for my other short haired dog of the same size. I recommend buying size up because it is a whole body suit. It has soft fleece lining and you can roll up the sleeves by adjusting the straps at the end of the legs. It is waterproof so it kept my dogs clean during pouring rainstorm! Highly highly recommend it! My ShihZhu needed a snowsuit because snow kept balling on her fur. A coat does not cover enough of her to stop the snowballs. This snowsuit arrived on time and is high quality. It does not hinder her movement and she scampers around the woods quite happily. She runs with no issues. The size was right, too. Fits her just right. This doggy jacket is great. Warm, lightweight and stylish. My little schnauzer mix looks ready for the slopes in Aspen! Only issue was size. The small was a tad too tight and so I requested a replacement. Michael at Chewy.com was extremely helpful and the new item is on its way. Will post pics once the jacket arrives. I recently took my dog to the snow for the first time and I didn’t want him to get cold while we were hiking so I bought him this for the weekend. It took him a few min to get used to it but he loved it once we left. My elderly shih tzu doesn't like being wet, but he loves his walks! I bought a rain slicker for him, but the hood just covered his whole face, and he kept stepping on the front bib when he bent his head down to sniff. I am so pleased we found this fleece lined rain suit--it works so much better! We went for a walk in the rain today, and he didn't seem cold at all when we got home. Bonus: Only having to towel dry his tail, paws, and head is so much quicker than his whole body! I have a 10 lb Maltese, Winston. This winter has been hard on us because of his stature, he gets snow balls on his legs. This snowsuit keeps him warm and dry. I put his boots on then tighten the legs of the snowsuit and he's able to stay out longer. This coat is perfect for those days 20 deg. F and below. Takes a couple minutes to put on but fits perfect. Our dog got used to it within a few minutes. Has good freedom of movement.